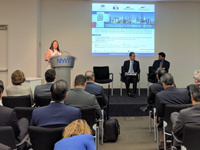 GFDD hosted the event “Innovation and Supply Chain Optimization Based on Production and Market Potentials in the Dominican Republic and the USA”, as part of Dominican Week 2016 (SEMDOMUSA), with the participation of GFDD’s partners National Supermarket Association (NSA) and the New York Institute of Technology (NYIT). Within the framework of the annual initiative of AMCHAMDR, that has been supported by GFDD throughout the years, representatives from AMCHAMDR, NSA, CONEP, and other institutions discussed the main challenge -and great opportunities- that the Dominican business community faces: increasing trade between the Dominican Republic and the United States through innovation and supply chain optimization based on production and market potentials. The Fellows Program Welcomes the New Researchers to the Dominican Republic! The Fellows Program, an initiative of GFDD and Funglode, is glad to receive scholars Fenix Arias, PhD in Urban Education from City University of New York (CUNY); Aireona Bonnie Raschke, PhD candidate in Biology and Society at Arizona State University; and Melvin Alvarez, MA candidate in Marine Affairs from University of Rhode Island (URI). They will contribute to the expansion of academic research pertaining to social and economic development, the environment and global governance. This group of fellows will conduct their research in Santo Domingo and other provinces such as Samaná and La Romana. GFDD´s Value of Life continues its international path with a new award: Best Documentary Jury prize at the 5th edition of Bangalore Shorts Film Festival (BSFF)! The Festival took place on June 12 in Bangalore, India and Value of Life was chosen among more than 90 short films submitted. The Jury was integrated by Dayal Padmanabhan, Award Winning Kannada Film Director, from Bangalore; Mohmammad Hemedani, Award Winning Animation Film Director & CEO Skyframe Studio, from Iran; N. Sivanandam, Award Winning Kannada Film Director, from Bangalore; and Dr. D.C Singh, Film Producer & Academician, from Delhi. Seeking to educate New York City high school students about the impacts of climate change and incentivize them into action, GFDD/Funglode put together a special film screening and panel discussion at the United Nations for students from the International School of Liberal Arts based in the Bronx and the High School for Excellence and Innovation based in Inwood. The film was the environmental documentary Sink or Swim: Learning the Crawl in the Maldives directed by Jon Bowermaster, was followed by a panel discussion with the award winning filmmaker and the Ambassador of Fiji to the United Nations, H.E Mr. Peter Thomson. The event also included a guided tour of the UN, to provide students with the opportunity to learn more about the international organization. GFDD partnered once again with the Dominican Republic Embassy in the United States to present the very best of the Dominican Republic during the 2016 Around the World Embassy Tour, a signature annual event in Washington, DC part of the Passport DC initiative. 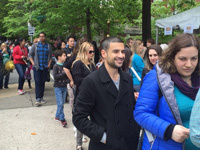 The Dominican Republic Embassy opened its doors Saturday May 7 to more than 8,000 DC visitors and residents for the event. As in previous years, GFDD showcased their many programs promoting sustainability for the environment, technology, education, cultural heritage, and internships and scholarships. GFDD launched its publication Lo Dominicano/All Things Dominican on May 6th, 2016 at the William V. Musto Cultural Center in Union City, New Jersey. 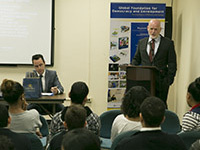 The event was organized in collaboration with leading members of the Dominican community in New York, such as Mr. Tilo Rivas, businessman, journalist, and member of the Hispanic Culture Foundation in Hudson County, New Jersey; and Eliezer Bueno, cultural appointee and community activist of the Dominican Diaspora in New York. Dominican singer and song-writer, Tony Bravo, delighted the audience with his melodies. 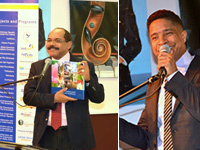 In Santiago de los Caballeros the book was launched on May 4th at the iconic Centro León before an avid and diverse public and with the company of famous musician Rafael Solano. 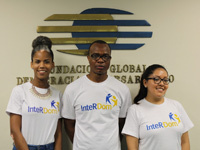 The 2016 InteRDom Summer Program officially began on June 9th, 2016 in Santo Domingo, Dominican Republic, welcoming a diverse group of students coming from the United States, England and Namibia. The students accepted into the program represent a wide variety of interest areas, and will experience an action-packed summer of internships, activities, and get-togethers; a one in lifetime opportunity to discover a unique country. Students hail from the University of Connecticut, USA; University of Utah, USA; and University of Westminster in London, England. You Still Have Time to Apply to Premio Globo Verde Dominicano and Have Your Film Traveling the World! The Globo Verde Dominicano Award is a unique opportunity for filmmakers, students and young professionals who want to venture into a fairly uncharted area in the Dominican Republic -the creation of environmental audiovisual material- as well as to show their work to a national and international audience. 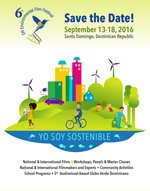 For example, the short film 7 Grams, winner of Premio Globo Verde Dominicano 2015, has been presented this year in 4 different international festivals: DCEFF in Washington, D.C.; Princeton Environmental Film Festival, in New Jersey; Finger Lakes Environmental Film Festival, in New York; and Festival del Cine Pobre de Gibara, in Holguin (Cuba); in addition to the Dominican Environmental Film Festival (DREFF) during the award ceremony last September. If you are Dominican or live in the Dominican Republic, there´s still time. Submit your work before July 31! 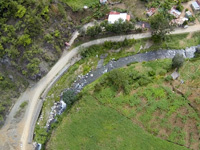 The EcoHuertos Program worked with fifty people linked to the Centro Educativo Jardín del Saber, in La Zurza on the creation of an organic and sustainable vegetable garden. The construction of the garden, an initiative without precedent in this area of the capital, relied on recycled materials and much creativity from the community. Old tires, plastic gallon containers, and bottles were prepared to be reused as planting containers. The tires were placed two by two according to their size, and bags and sacks were placed inside to be filled with substrate. The garden, installed on the roof of the Center, is now a reality and has produced eggplants, tomatoes, chard, celery, baby spinach, lettuce, cilantro, peppers, onion, beetroot, oregano, as well as attractive ornamental plants for bees and other pollinators. Santo Domingo will host, from July 5 to 7, the annual meeting of the Ibero-American Network of Young Leaders (RIJL, for its acronym in Spanish). Under the motto "Leadership 360: educate, innovate, affirm... make an impact", the meeting will take place on the premises of Fundación Global Democracia y Desarrollo (Funglode) and Universidad Autónoma de Santo Domingo. It will be open to the general public prior registration. Attendees may participate in a series of talks and presentations by national and international experts on issues related to education, innovation, entrepreneurship, and sustainability. As a special event hosted by GFDD, the Dominican Republic Environmental Film Festival (DREFF), the DC Environmental Film Festival (DCEFF), and the Inter-American Development Bank (IDB), the Dominican documentary 'Death by a Thousand Cuts' will be screened on Wednesday, July 27th, 2016, in Washington, DC at the Inter-American Development Bank (IDB). The screening will be followed by an interesting panel discussion with the filmmakers and special guests. When: Wednesday, July 27th, 2016. 6:00 p.m.
Where: Inter-American Development Bank (IDB), 1300 New York Ave NW, Washington, DC 20577. This event is free. RSVP required. Join Us for the 8th GFDD Golf Tournament on September 26th in New York! GFDD and Funglode are pleased to announce the 8th edition of its GFDD Golf Tournament that will take place, once again, at the prestigious Fresh Meadow Country Club in Long Island, New York on Monday, September 26th. As a tradition, former Major League Baseball Player and long-standing friend of GFDD, Mr. Juan Marichal, will be the Honorary Starter of the tournament. The event will feature the attendance of special guests, as well as the presence of former President of the Dominican Republic and President of GFDD/Funglode, Dr. Leonel Fernández.